In January, a plumber installing pump pipes for an in-ground pool in the backyard of a one-year-old house in Winter Garden, Florida found a piece of bone in the sand. He reported it to the police who brought the fragment to Orange-Osceola County Medical Examiner Dr. Jan Garavaglia. She determined that the bone had come from the face of a child of around 10 years. There was some mummified tissue still attached to the bone, which concerned her because most archaeological remains are devoid of any tissue. She informed police that there might be a recently dead child illegally buried on the work site. 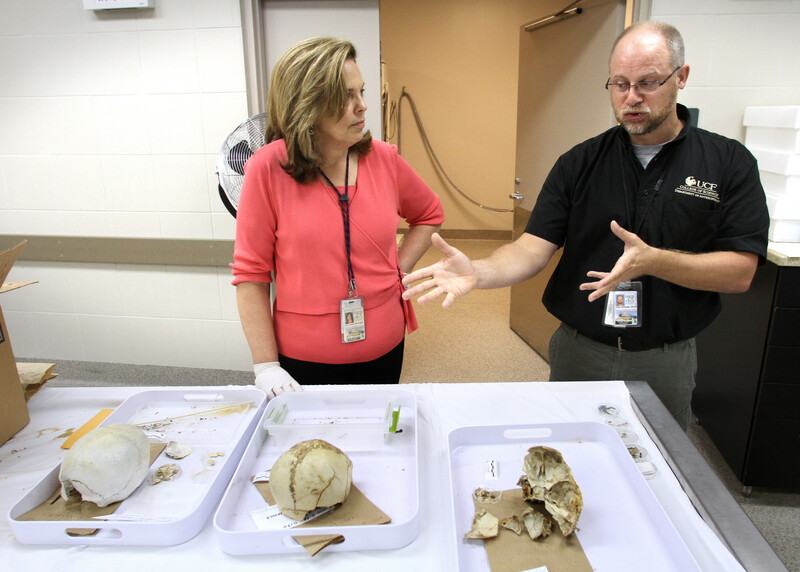 University of Central Florida archaeologist Dr. John Schultz worked with the forensic specialists to ensure the site was handled as an archaeological dig instead of just as a pure crime scene. 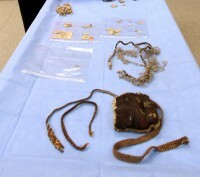 They didn’t find the remains of a murdered child, but they did find two crania, a dozen shards of pottery, bits of newspaper from 1978, textiles including an embroidered purse still carrying woven slings and a netted bag with a strap made out of non-human hair. When Dr. Garavaglia X-rayed the skulls, she and Dr. Schultz were able to confirm that they were at least hundreds of years old. The skulls belonged to an adult male and a child, and they both had “Inca bones,” a triangular interparietal bone that sometimes develops where the posterior fontanelle used to be. It’s not exclusive to them, but it is highly characteristic of Peruvian mummies, particularly Andean Inca tribes between 1200 and 1597 A.D. 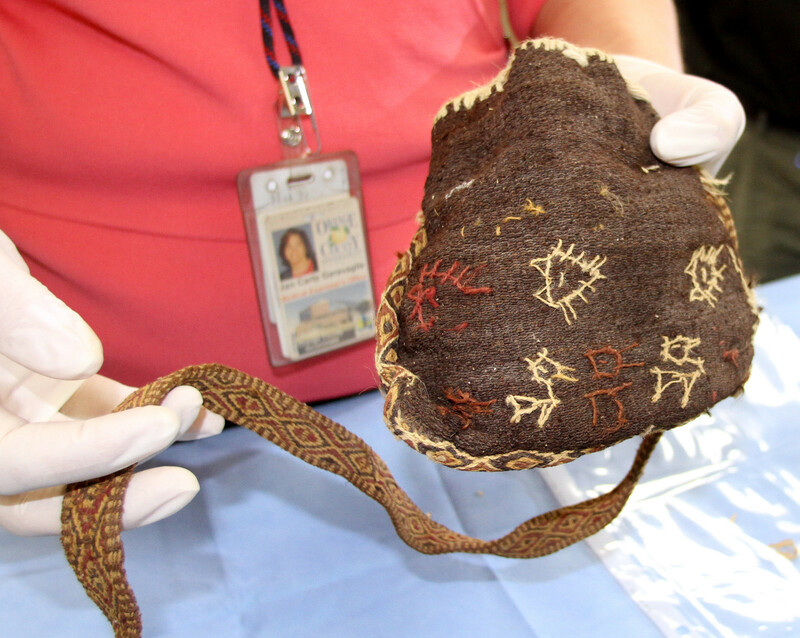 Researchers identified the style of the pottery and textiles as coming from the Chancay culture of coastal Peru. Their dates are in keeping with the Inca bone period, between 1200 and 1470 A.D.
At this point it became clear that the Winter Garden swimming pool was a secondary burial site. Someone had placed these artifacts in the ground after March 16, 1978 (the date of the newspaper), but who and exactly when remains a mystery. We do know that the land which is now a subdivision used to be a camp for migrant orange pickers. For thirty years until the mid-1980s, migrants from all over Central America and the Caribbean lived in wooden barracks in the area. It’s possible that the remains and artifacts could have been buried by one of those migrant workers, perhaps as part of a religious ritual, perhaps for safekeeping. It’s also possible that tourists brought them back from a trip to South America, although the purchase and removal of archaeological artifacts has been illegal in Peru since the early 20th century. Developers bought the land and built it into a subdivision four years ago. They had to grade it extensively in order to build the orderly houses and streets, so it’s an incredible stroke of luck that they missed the spot that happened to contain ancient human remains and incredibly delicate textiles. Then the house was built on the property just a year ago, and they fortuitously missed the spot too. 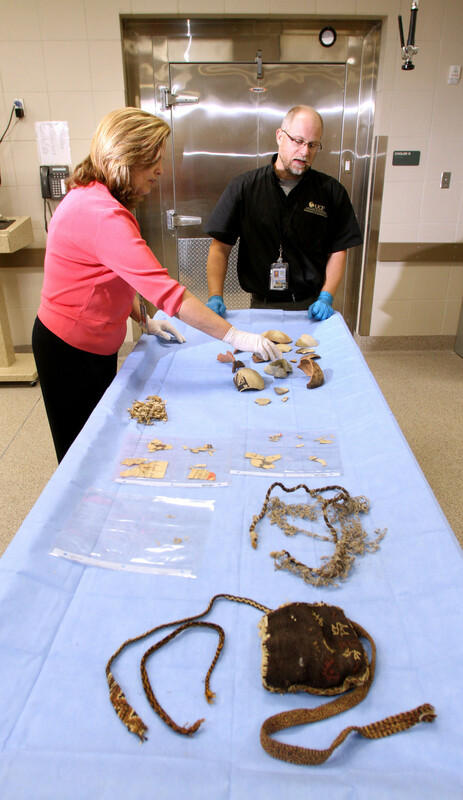 The bones and artifacts will remain at the Medical Examiner’s office for now. Dr. Schultz intends to study them extensively with an eye to publishing the results so they can be used as examples for future crime scene/archaeological finds. The ultimate goal, however, is to return the pieces to Peru. This entry was posted on Monday, May 14th, 2012 at 11:58 PM	and is filed under Ancient, Modern(ish). You can follow any responses to this entry through the RSS 2.0 feed. You can skip to the end and leave a response. Pinging is currently not allowed. They didn’t move the graves! I tried to find a proper Poltergeist angle for the title, but alas, I failed. Location! Location! Location! This newly built property has all the amenities including quiet community, radiant heating, energy efficient windows, in ground pool and ancient burial site. Ghosts + 3% cashback with preferred lender. Contact Si Atoja to view this exciting new offering! These remains and artifacts should be returned to Peru. Peru has been relentlessly looted over the years for it’s gold and ancient artifacts mostly by the U.S. and Spain. The artifacts really have the greatest value being returned to where they belong. Bad enough that the IMF rapes these poor countries, instills genocide birth control and backs them with threats of war. Maybe if these poorer countries were able to keep what belongs to them, they wouldn’t need loans with outrageous interest rates. I just checked this post in IE9 and it renders fine for me. No errors, no visible bugs. What version of IE are you running and what’s going wrong? If you really want to return Peruvian posessions, lets start with all the gold the Spaniards pillaged and lied and killed for. I can think of crimes with a far larger headcount — the Holocaust, for instance, or Stalin’s purges — but really, what is the point of playing “my agenda-based grievance is greater than yours?” There’s no prize at the end. Where exactly were these pieces found in Winter Garden? Is this where Covington Chase is now located?